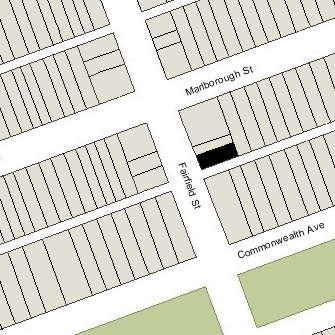 20 Fairfield is located on the east side of Fairfield, between Marlborough and Commonwealth, with 18 Fairfield to the north and 239 Commonwealth (22 Fairfield) to the south, across Alley 426. 20 Fairfield was designed by architect William Whitney Lewis and built in 1875-1876 by Isaac C. Cooper, mason, and MacKenzie & Campbell, carpenters, as the home of Francis Richmond Allen and his wife, Elizabeth Bradlee (Wood) Allen. 20 Fairfield was numbered as 12 Fairfield until about 1881. Francis Allen purchased the land on which 20 Fairfield was built on June 11, 1875, from Carrie E. (Ellis) Evans, the widow of Franklin Evans. It was part of a larger parcel originally purchased from the Boston Water Power Company on February 16, 1863, by Daniel Davies, Jarvis Dwight Braman, and Grenville Temple Winthrop Braman. Grenville Braman was treasurer of the Boston Water Power Company, Jarvis Braman was his brother (and later president of the company), and Daniel Davies, a housewright and master carpenter, was Grenville Braman’s father-in-law. Both the lot at 20 Fairfield and the abutting lot to the north, at 18 Fairfield, included a three foot wide easement at their eastern boundaries, providing a passageway for access to the alley for them and for the lot further north at 16 Fairfield. Click here for an index to the deeds for 20 Fairfield and for a plan of the original land. Francis and Elizabeth Allen had married in January of 1875 and lived with her father, Charles Greenleaf Wood, at 121 Commonwealth while the Fairfield Street house was being built. Francis Allen was a dry goods merchant but soon after completion of 20 Fairfield, he withdrew from his business and studied architecture. He subsequently became a prominent architect. 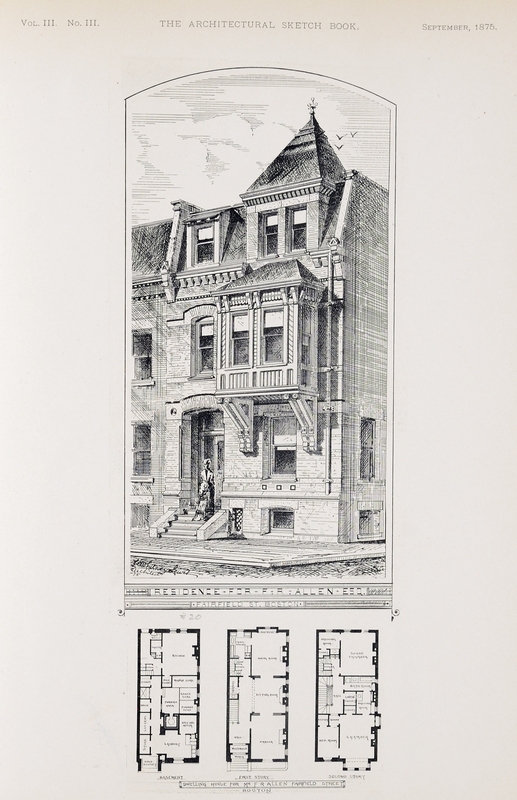 One of his first designs (in 1879) was for 274 Marlborough, around the corner from 20 Fairfield, which became the home of his wife’s brother and sister-in-law, Charles Greenleaf Wood, Jr., and Mary (Knight) Wood. 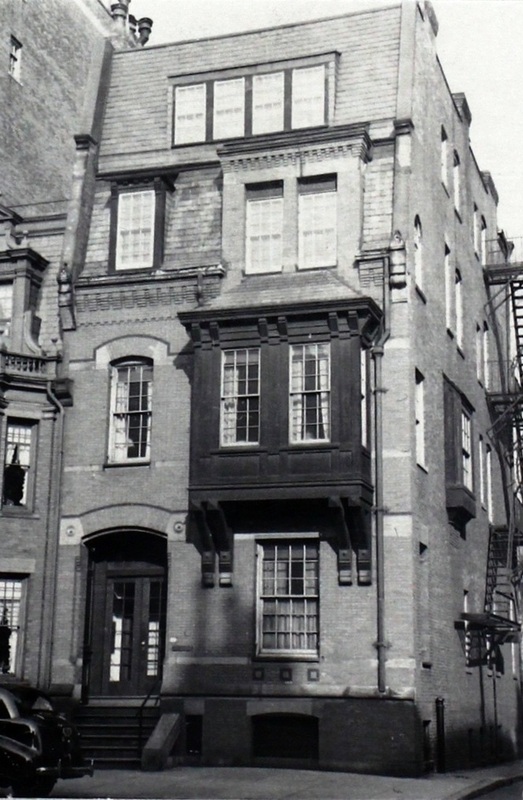 Elizabeth (Wood) Allen’s father lived with Charles and Mary Wood at 274 Marlborough; he was treasurer of the John Hancock Insurance Company. Elizabeth Allen is shown as the owner of 20 Fairfield on the original building permit application, dated May 14, 1875. On June 11, 1875, Francis Allen entered into a party wall agreement with Carrie Evans, who continued to own the lot to the north, where 18 Fairfield would be built. Construction of 20 Fairfield probably began soon thereafter and the Allens were living there by the 1876-1877 winter season. 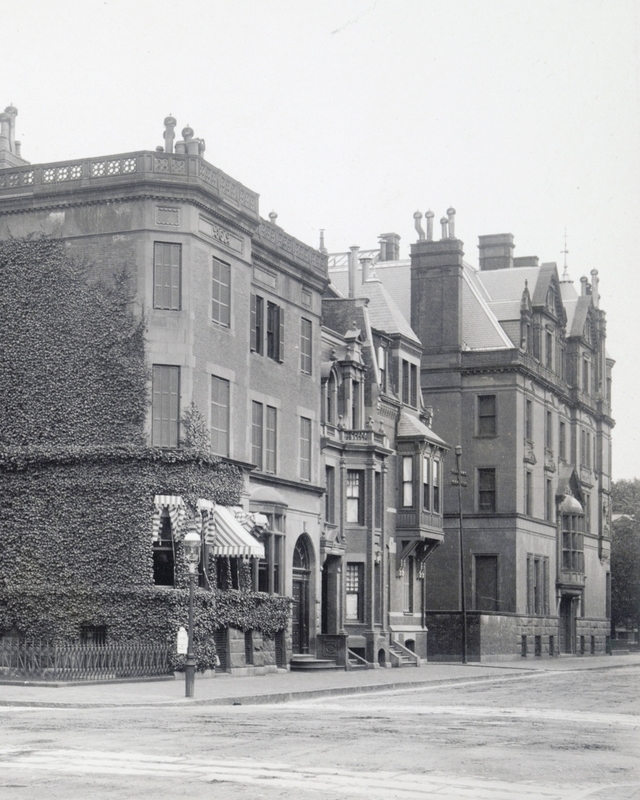 During the 1877-1878 winter season, the Allens were living in Paris, where Francis Allen was studying at the Ecole des Beaux Arts, and 20 Fairfield was the home of Henry Stackpole, a banker, and his wife, Bessie (Value) Stackpole. 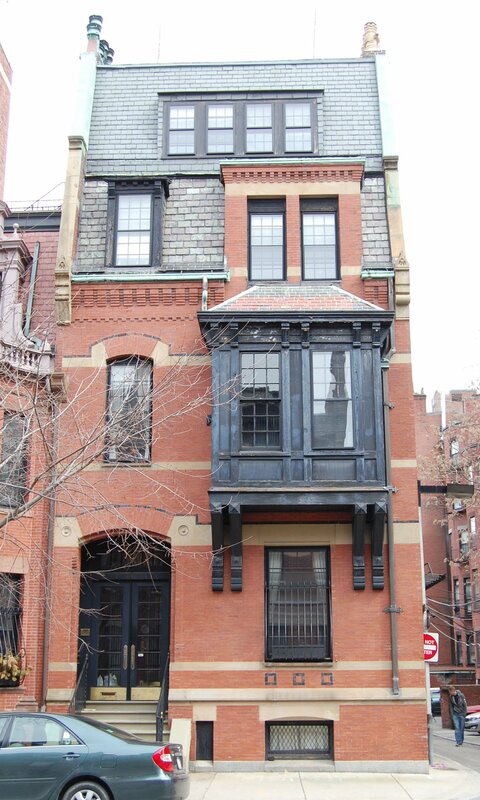 They had lived at 313 Beacon in 1877. 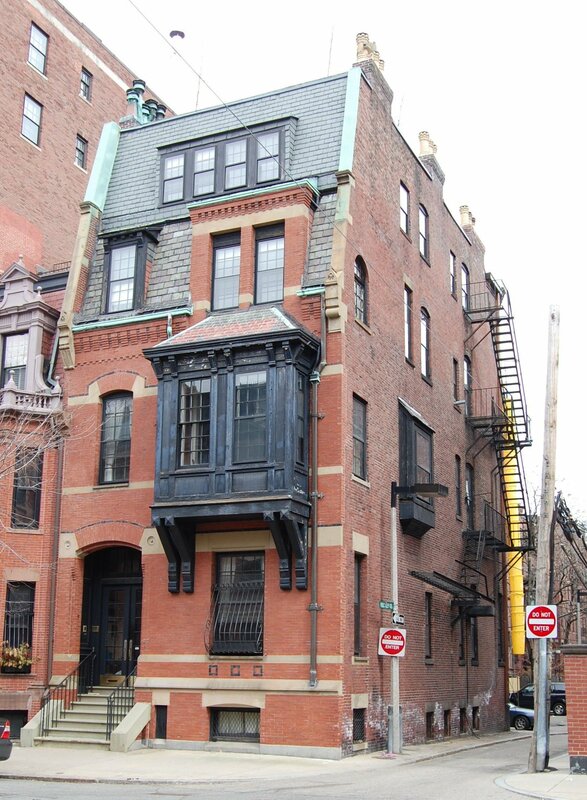 By 1879, they had moved to 307 Beacon and 20 Fairfield was once again the Allens’ home. On February 21, 1883, Francis Allen transferred the property to a trust with his wife as beneficiary, with William Sohier and Henry G. Denny as trustees. In about 1893, Elizabeth Allen’s father, Charles Greenleaf Wood, came to live 20 Fairfield with the Allens. He died there in April of 1894. Francis and Elizabeth Allen continued to live at 20 Fairfield until about 1925. During the 1924-1925 winter season, 20 Fairfield was the home of Malcolm Whelen Greenough, who graduated from Harvard in 1925 and would become an investment banker, and his wife, Kathleen Lawrence (Rotch) Greenough. They had married in June of 1925 and 20 Fairfield probably was their first home together. By the 1926-1927 season, they had moved to 294 Beacon. By the 1926-1927 winter season, 20 Fairfield was the home of Charlotte Elizabeth (called Elizabeth) (Howe) Sproul, the widow of Pittsburgh attorney Frank Penrose Sproul, and their son, Frank Penrose Sproul, Jr., a student at Harvard. They previously had lived at 320 Marlborough. They continued to live at 20 Fairfield in 1928. By 1930, they were living at the Ritz-Carlton Hotel. Frank P. Sproul, Jr., was killed on November 6, 1932, when a small airplane in which he was traveling, piloted by Frederick Lothrop Ames, III, crashed at Tower Hill in Randolph. 20 Fairfield was not listed in the 1929-1931 Blue Books and was shown as vacant in the 1930 and 1931 City Directories. Elizabeth Allen died in November of 1930. On January 31, 1931, Benjamin Preston Clark, the successor trustee of her trust, transferred 20 Fairfield to Francis Allen. On the same day, Francis Allen sold 20 Fairfield to Ethel (Shrigley) Seymour, the widow of Dr. Malcolm Seymour. Their children, Helen Emma Seymour and Malcolm Seymour, Jr., lived with her. They previously had lived at The Eliot at 370 Commonwealth. She also maintained a home in Cohasset. In May of 1931, Helen Seymour married to John Washburn Coolidge. After their marriage, the lived at The Eliot. Ethel Seymour remarried later that year to Dr. Everard Lawrence Oliver, and they made 20 Fairfield their home. He previously had lived at 222 Beacon. Malcolm Seymour, Jr., continued to live with them at 20 Fairfield. E. Lawrence Oliver was a dermatologist and professor of dermatology at Harvard Medical School. He also maintained his medical office at 20 Fairfield. Malcolm Seymour married in 1938 to Mary Deforest Wilson. After their marriage, they moved to an apartment at 48 Commonwealth. He was an engineer. In 1937, the Olivers remodeled 20 Fairfield, adding a fourth story and subdividing the house into several apartments and/or medical offices. Plans for the remodeling, designed by architect David Allen Reed, are included in the City of Boston Blueprints Collection in the Boston Public Library’s Arts Department (reference BIN P-147). On March 18, 1941, 20 Fairfield was acquired from Ethel Oliver by Beatrice Mary (Carney) Culhane, the wife of Arthur Joseph Culhane. They lived in Arlington at the time of the purchase, and later moved to 28 Belvidere. By 1943, they lived in one of the apartments at 20 Fairfield. He was employed with the New York, New Haven & Hartford Railroad. On August 30, 1946, Beatrice Culhane transferred the property into both of their names. The Olivers continued to live in one of the apartments at 20 Fairfield (and in Cohasset), and he continued to maintain his office there, until about 1951, when they moved to Florida. The Culhanes continued to live at 20 Fairfield until about 1954. On April of 1955, 20 Fairfield was acquired from the Culhanes by Margaret M. Dunford. She lived at 306 Riverway. In March of 1961, in anticipation of selling the property, she filed for (and subsequently received) permission to legalize the occupancy as five apartments, indicating that the building had been occupied as such since she acquired it. On June 1, 1961, 20 Fairfield was acquired from Margaret Dunford by real estate dealer S. Clifford Speed. Two weeks later, on June 13, 1961, he sold the house to Thomas F. Keating, Jr., trustee of the Pond Realty Trust. On September 1, 1961, 20 Fairfield was acquired from the Pond Realty Trust by Jack Eadie Molesworth. He was a philatelic dealer specializing in Confederate stamps. A leader of the ultra-conservative Young Americans for Freedom and a Republican State Committee member, he was an unsuccessful candidate for Congress in 1964. He and his wife, Phyllis (Carpinteri) Molesworth, lived in an apartment at 166 Beacon in the early 1960s, but had moved to an apartment at 88 Beacon by 1964. In November of 1962, Jack Molesworth filed for (and subsequently received) permission to subdivide the apartment on the first floor and increase the number of units from five to six. The property changed hands and on October 5, 1984 was purchased by James Ralph Cole and his wife, Susan Frances (Sweeney) Cole. The same month, Ralph Cole applied for (and subsequently received) permission to remodel the second and third floors, reducing the number of units from six to four. On March 29, 2007, 20 Fairfield was purchased from the Coles by Warren J. Katz and his wife, Ilana K. Katz. In August of 2008, Warren Katz applied for (and subsequently received) permission to convert the property back into a single-family dwelling. It remained assessed as a single-family dwelling in 2015.